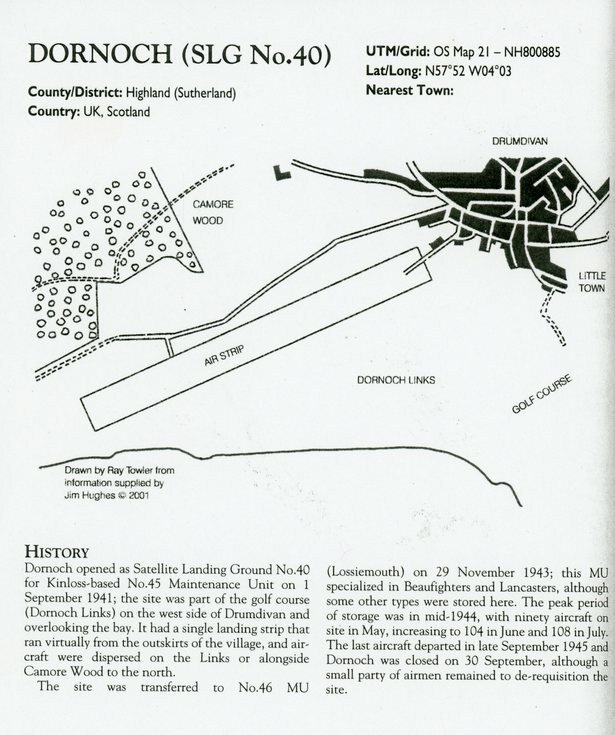 Extract from a book 'Action Stations 7, Military Airfields of the North East and Northern Island' by David J Smith, with heading 'Dornoch (SLG No 40)'. The text provides less detailed information than that provided in the document at 2018.023.01 and the accompanying location sketch map is not as recorded elsewhere. It shows a single landing strip starting from Meadows Park football pitch and extending parallel to Sutherland Road to Lonemore. Photographs indicate the SLG had two landing strips, one aligned with the existing airfield and the other crossing it and extending towards the town towards River Street, Littletown.